Hi there! I’m Dini and I am the recipe developer, photographer, writer, cookbook author and “mad scientist” behind The Flavor Bender. 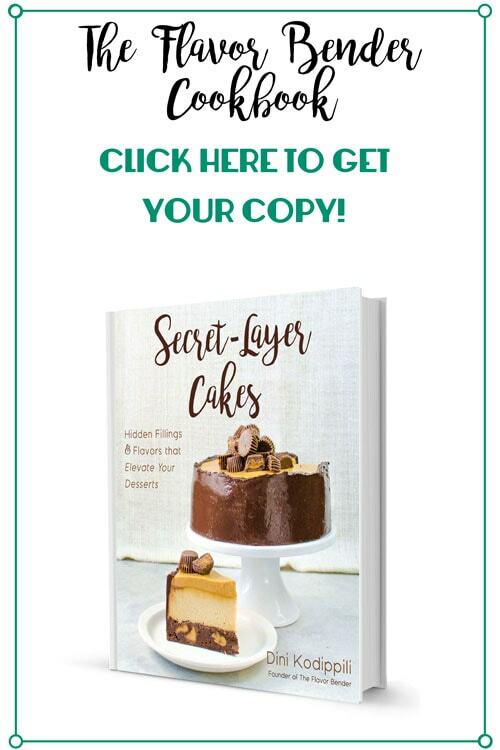 🙂 Here you will find recipes and recipe ideas that combine flavors in new and wildly creative ways that will make you fall in love with cooking and baking (if you haven’t already)! I have a particular fondness for breakfast, brunch and dessert recipes, and that’s mainly what you will find on The Flavor Bender. Check out my Recipe Index to find out more. I share original recipes that I develop on my own through research, experimentation, trial and error – like the original Fruit Infused Shimmery Liqueur, Homemade Shimmery Liqueur, Color Changing Alcohol, Galaxy Lemonade. If I’m ever inspired by or adapt someone else’s recipe, it will be clearly indicated in the post and the recipe. Recipe basics and techniques that you can master along with me AND learn to adapt, to create your own version with your own flavors and flair – like perfect homemade choux pastry, easy rough puff pastry, perfect homemade marshmallows, doughnuts, classic pound cake, vanilla cake, chocolate cake etc. Sometimes you will find recipes and suggestions for those with specific dietary restrictions (such as dairy-free and gluten-free diets) and even vegetarian and vegan diets. You will also find recipes for classic meals with a twist and recipes inspired by fictional characters in books, movies and on TV (yep, I’m bit of a geek!). I really am a mad scientist and adventurer in the kitchen and I love to experiment with flavors, ingredients and cooking methods to see what works and what doesn’t. Not everything works, but when it does, the results can be spectacular and you will be able to read about it on this blog. I love coming up with recipes that bring different food cultures and distinct flavors together. That’s my strength, my passion. Cooking is a way to expand your horizons and travel the world without ever leaving your kitchen, and if you’re willing to give it a chance, you will soon discover wonders that you never knew existed. Cooking should never be a chore, even if you’re short on time and patience. Cooking at home saves you a ton of money and is healthy in the long run. And the best way to cook more is to make it fun and enjoyable. I grew up in a culture where food brought families together. So don’t ever underestimate the power of a good home-cooked meal! This blog used to be called Giramuk’s Kitchen and I rebranded it as The Flavor Bender in July, 2015 because that name better represented what this blog was about. Oh, and Avatar: The Last Airbender is one of my favorite animated TV shows. In case you were wondering, my blog logo (the one you see at the top of this page) is an “f” and a dopamine molecule that’s masquerading as a “b”. Dopamine is a chemical in your body and it’s responsible for emotions like reward and pleasure in the brain – emotions that are strongly associated with cooking and baking for me. I was born in Sri Lanka, grew up in New Zealand, and lived in Australia before moving to the USA with my husband in early 2014. I have moved 14 times on top of that. I don’t think I’ve grasped the idea of settling down quite yet. I currently live in Columbia, MO. I have a Bachelor’s in Science, a Master’s in Clinical Audiology, and a PhD in making a mess of my kitchen. I worked as a Clinical Audiologist for several years in Australia and spent too much of my time convincing husbands that they did indeed have a hearing impairment and it wasn’t just their wives that they couldn’t hear. I had mixed results. I started this blog in late 2014 because I couldn’t imagine doing anything else with as much passion. I learned how to cook from my mother when I was seven. It’s still the best lesson I’ve learned in life so far. 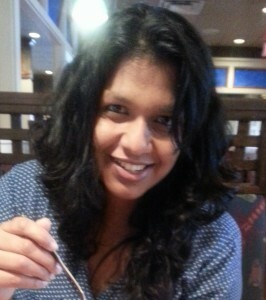 Chocolate is both my strength and my kryptonite and I can NEVER say no to a margarita! I love drinking coffee and I’m a trained Barista. It’s a flavor that I use a lot in my baking. I have worked in the food industry briefly, waiting tables and cleaning dishes while stealing the occasional croissant. Baking cakes is my forte and cheese is my favorite thing to eat. Any kind of cheese. Going through the cheese selection at my local grocery store every week is a form of therapy for me. Really. I would do it for hours if my husband let me. Give me cheese and chocolate together though, and I’m in heaven. I love to sing and draw and keep wishing I could pursue those interests more seriously. I’m mortally scared of heights and roller coasters, much to the disappointment of my husband. Mr K (as you’d occasionally find him referred to on the blog) is my husband, principal taste tester, proof reader and critic. I love watching horror movies, though they terrify me to my core. And then I watch a mindless comedy to counteract the effects of the horror movie. Cleaning is a skill I’m yet to master, much to the dismay of my husband. You can subscribe for FREE recipes and updates from The Flavor Bender by clicking here or by entering your email address in the subscription box in the sidebar. If you’d like to work with me or contact me, please email me at theflavorbender(at)gmail(dot)com. I love to hear from you guys and will ALWAYS respond to your emails – if I don’t, just send me a friendly reminder because your email may have gotten lost in the folder. You can also connect with me through social media on Facebook, Twitter, Instagram, Pinterest, Google-plus .